Propane or gas? What type of emergency implement fuel is the best choice for you? Let’s assume an emergency scenario where wood heat/light are not an option. You can’t use a campfire and a biomass stove is out of the picture. Maybe there is extreme fire danger, open fires are prohibited, or there isn’t a ready supply of fuel. 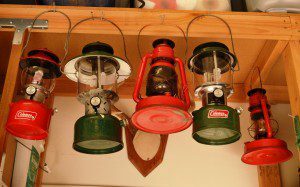 Should you have a propane or gas lantern or stove? Tank or canister? What are the advantages, disadvantages and what considerations should you be aware of? I can’t make up my mind which fuel is best. I currently have one propane and four Coleman gas lanterns. I own a dual-fuel campstove, gas backpacking stove, and one small stove that screws on top of a propane cylinder. My go-to stove for all off grid cooking is a double burner Camp Chef propane cooker that uses bulk propane. I have a propane space heater for emergency warmth. Your emergency preparations should include some thoughts about lighting, heating and cooking implements over the long term. Basically, your choices will boil down to two main categories: propane or liquid fuel (gasoline). Before you buy anything though, consider where the appliance will be used. Are you car camping, where weight is not an issue, or backpacking above the tree line, where weight will be a major consideration? What temperatures will the item most likely be used in? How important is long term use and the ability to replenish the fuel? Convenience and ease of use: Does the fuel source affect how easily the implement can be used? There is no pouring, priming or pumping with propane. With gas, the implement must be filled, and sometimes primed and pumped. While the gas implement is operating, it will occasionally need to be pumped. Propane or gasoline? Check out the shopping considerations to decide. Fuel availability: The dual-fuel gas implements can use unleaded gasoline, at a fraction of the cost of Coleman fuel or white gas. I’ve bought Coleman gas at tiny little stores in out-of-the-way areas of northern Minnesota, where the store inventory was sketchy at best. Conversely, I’ve also seen standard 16.4 oz disposable propane gas cylinders at many of these same stores. I’m guessing gas is still easier to find, but bulk propane is also very common and cheap. 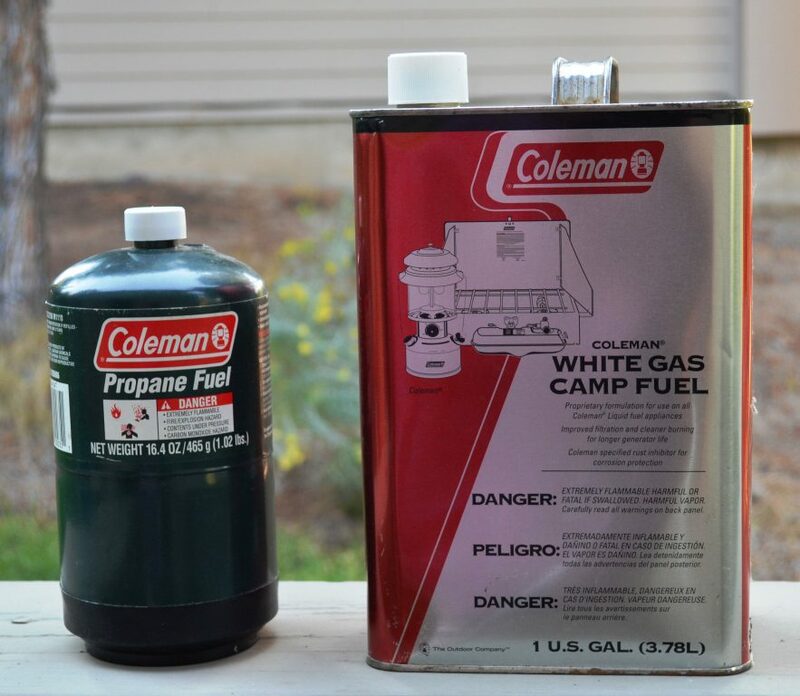 Cost: Last week at the local WalMart, the disposable propane cylinders were on sale for about $6 for two cylinders, versus almost $10 per gallon for Coleman fuel. The dual-fuel gas stoves and lanterns are the clear winners in the cost-effectiveness category, with unleaded gasoline from the pump costing about $4 per gallon. Not to mention, a dual-fuel implement can be re-fueled with a siphon hose from a vehicle gas tank. Safety: As a Boy scout volunteer, I see safety around fire as paramount. I’ve noticed that the propane lanterns and stoves are easier, and hence safer, for the boys to light and use. There is no priming, pouring or fuel to spill. The idea of a container of gasoline anywhere near an open fire, with kids around, makes my blood run cold. Implement design: My Coleman model 442 backpacking gas stove has a listed weigh of 24 ounces. That, in part, is due to the pump and generator required for a gas stove. My single burner propane stove that screws on top of a propane cylinder weighs less than half that. “Green” design: I don’t like the disposable propane cylinders – they work great, but it seems to be a terrible waste to throw away the empties. For a long-term situation, such as a lengthy campout, though, a bulk propane tank can be filled for about $2-something a gallon, making that option an economic favorite. Temperature: Cold affects propane’s effectiveness. In extreme cold, a propane cylinder may not work at all. Gasoline is not affected. That’s one reason why I have so many gas-powered implements. Like anything, the final decision on whether to invest in propane or gas appliances will depend on your individual needs and perceived usage. Good luck with picking a favorite – I haven’t been able to come up with one yet! 14 Comments on "Propane or gas: How to choose a lantern and/or stove fuel"
My solution is I have all propane appliances, camp stove, heater, lanterns, and generator. I do not see cold as an issue as far as using propane, I have about 25 cylinders I buy on sale when I can for around $2.00 a piece, I have a 100 gallon bulk tank to run my generator,and I have an adapter to fill the cylinders, these dont completely refill the cylinders, and a 500 gallon LP tank to heat my house, I have kits to convert my natural gas furnace and waterheater to lp in case of an emergency. I have a wood burning insert for my fireplace, I also have 1000w of solar panels, and 500 amp hours of batterys, for storage. also encluded is 60 days worth of food, that I buy a little at a time when I go grocery shopping, I always check the dates and keep them current most grocery store items are good for a year or two out. I also have long term items stored. I keep them in 16 gallon air tite plastic barrels. I have my own well which can be powered with the generator,, and 110 gallons of water storage in my basement. and a motor home than can be ready to roll with a 1/2 hour notice loaded and going. I also have 110 gallons of unleaded gasoline in two 55 gallon barrels on site, with stabil in it, I use out of one after a year or so and replensih it and use out of the other 6 months later, this way I can keep usable gas around just in case, I been doing this forever but a newbe can do the same thing over time and not feel any real pocket book ouch. you have to eat anyway. I have 6 months of personal items ie toilet paper etc I also have 2 way radios with a 25 to 50 mile range, if there is a severe power outtage cell phones wont work. I ve done all this a little at a time spend $10 more every time you go grocery shopping, buy 5 gallons of gas and put it into perminate storage, etc.buy a solar panel or two when you get your income tax refund etc. doing it this way is almost pain free, I also garden and I live in a rural but not isolated area. I feel Im about as good to go as I can get, and I did it pain free. I like the duel fuel ones, lets me use unleaded gas in need be. I have a complete set of both fuels and stoves and lanterns just to give myself a little more versatility. Having multiple ways (options) to cook/boil water is always a good idea. With that being said, Coleman makes dual-fueled stoves & lanterns which use both coleman fuel & regular unleaded gasolene. And gasolene may be easier to locate later into the “event” than other fuels. the problem that I have is finding away to burn without alot of oder. Looking on CL, I was able to find a half full 50 gal. propane tank for $50. I bought an adapter for a small camp stove…in an emergency, I would be able to cook for a long time. Something to think about…take care and stay safe! I posted elsewhere that I lived out in the Alaskan bush for 2 years in a cabin I built myself. We used LPG double burner together with woodburner to cook because LPG bottles were more convenient to pack out to the cabin (everything was pulled by sled on skis) and it burned clean for indoor use. Down side of LPG is its energy value drops off considerably when cold. Where liquid fuels do not. I always carry a MSR dragonfly for portable backpacking with a couple 750 ml. fuel canisters. Kerosene lamps are a nightmare of extra work, trimming wicks, keeping the mantles from breaking. We only used them first few months and then resorted to running electric lights off generator and batteries. If you’re trying to cook and run a generator at a permanent homestead, please consider biogas. Same as natural gas, its energy value does not drop off when cold either. I remember living in alaska and halling in fuel when the lakes froze. In those days is was a barrel stove kit and unleaded gas in a colman lantern. LNG had one major advantage over gas, heating oil etc. Liquid fuels can become gummy or evaporate. I had issues with storing them over a period of time so you had to rotate stock. With LNG it lasts years so long as you keep the tanks clean and dry so that they do not rust. We lost power one time for a week when it was minus 30 and ran a generator off of LNG. With LNG you do not have issues with carborators or injectors. So I guess it depends on what you need the fuel to do, heating, lighting, running an engine, etc. One of the greatest assets to the prepper is redundancy. Have a backup for everything, have a backup for the backup, have another backup… you get the picture. When it comes to heat, light and cooking, it pays to have a variety of equipment to fall back on. I have gasoline/white gas stoves and lights, Three Perfection 500 kerosene heaters (two with glass sides) that provide room heat, light and can be cooked on, twenty five kerosene lamps and hurricane lanterns as well as an assortment of propane appliances for all functions. Most of these pieces of equipment I picked up over the years at flea markets and garage sales, except for the two glass sided Perfections which I found in near mint condition at an antique store in Shipshewana, Indiana for twenty bucks each. Yes, kerosene devices do take a little more maintenance but it’s no big deal. I can wash the chimney and trim the wick in about one minute. And the ones I have don’t use mantles. I guess the main point is that one can never have enough prep equipment. Be a bummer to find your self with too little. Happy prepping, folks. Hope this helped some. As an avid camper I was overjoyed to find yet another stove that met all of our needs. The Volcano Grill was perfect. Not only does it have the ability to cook with regular charcoal out of the bag, but it can burn wood and has an adapter for LP gas. There is something reassuring about having yet another fuel source when one or two of them may be scarce or using them would not be appropriate for the specific conditions or situation you find yourself in at the time. As a prepper, stove and lantern are two of the necessities we definitely need to have. The factors pointed out on differences using propane and gas to run these two are quite helpful. Although both are clearly available, propane is easier to use, safer, more environment friendly and a lot cheaper than the use gas. These variables are very important because propane can be used by kids without giving us a heart attack to see them close to it, gives a good feeling of not harming the environment any further and definitely save money in which maximizes our savings and enabling us to budget better. If any of you are considering on converting to propane, check this out http://gomowpropane.com/conversion-plans/. It help me a lot because it was very easy to do on your own, time saving and is truly a money saving investment. Trust me, I did a lot of research and by far, this is the best I got.